For at least a decade, this wedge of land just west of Jamaica Pond has been a hidden haven for bike enthusiasts. They came in here, hand-built trails of bumps and jumps, and got airborne. Tucked between Parkman Drive and Prince Street and largely hidden in the trees, it remained secret. And then a couple of years ago, Kyle Orrico and a couple of buddies decided to make the unofficial dirt jump park into something more ambitious. What they achieved leaves you gape-mouthed with wonder. It starts with perfectly formed bumps, and symmetrical berms. A hairpin turn is glass-smooth. Beyond it are huge doubles — ramps more than 10 feet high — where cyclists soar. Three guys made all of this, using just shovels and occasional help from friends. It took thousands of hours. They did a great job. So great, the city is shutting it down. The new scale of the place made it much easier to spot. Greenspace devotees freaked out. 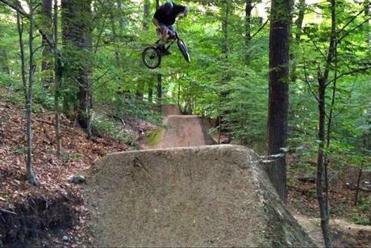 To build their berms and jumps, Orrico and his friends dug large holes into the forest here, leaving roots on some dozen trees exposed. The parks department says that will eventually kill the trees. The city is preparing to take down the ramps and return the land to its former state, which probably will cost up to $10,000, says Parks Commissioner Chris Cook. Orrico says the trail makers would be happy to work with the city to cover up the roots, and find a way to keep the track, which he says activates a patch of park that wasn’t being used for anything, unless you count trash dumping and drug-taking. It doesn’t matter if people use that patch of forest, says Gerry Wright, president of the Friends of Jamaica Pond. It matters only that it is there, serving as a watershed, part of an ecosystem. It’s easy to sympathize with Wright, especially when he puts it in those terms. But Orrico and company make a compelling case, too. Boston desperately needs the initiative and inventiveness this bike trail represents, not to mention the impulse to activate a moribund place. Too often, that impulse has no outlet, stymied by the city’s hidebound ways. So we see rogue initiatives: Public art like Matthew Hincman’s terrific two-backed bench, which sat by Jamaica Pond for days before city workers removed it (it has since been returned). And other stunt parks — a bike park in the Fenway that was eventually razed, and a skate park on the southwest corridor in JP, which the city also removed, then returned. For bikers, the desire to jump is truly pent-up. A decade ago, they were promised a skate park under the ramps by the Zakim Bridge. It has moved glacially, beset by funding issues and red tape. There is finally enough money to begin construction in the fall, but only if further bureaucratic hurdles can be cleared. Who can blame Orrico and his friends for taking matters into their own hands? The city is sympathetic. “They obviously spent an incredible amount of time and energy,” says Parks Commissioner Cook, who was a skateboarder in his youth. “The scale of it is very impressive.” Cook says he wants to work with the cyclists to find another spot for a dirt jump park, away from the hallowed ground where Orrico’s track sits. But the bikers lose this masterpiece. Even Olmsted might be sad all their work was wasted.